According to census records Henry C. Botjer was born in Germany in 1872 (1900 records) or 1873 (1910 records) and immigrated to the United States in 1888. It appears that he ran his own business from 1906 until 1918, when he passed away. Between 1906 and 1910 his address was listed as 353 Broadway or sometimes Broadway, corner of Second Avenue in Long Island City, Queens. 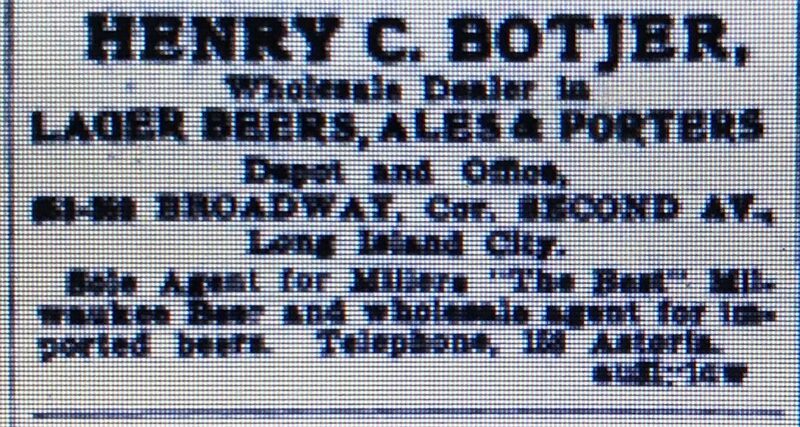 An advertisement in the February 4, 1907 edition of the Brooklyn Star called him a “Wholesale Dealer in Lager Beers, Ales and Porters with a depot and office both located on Broadway, corner of Second Avenue. The advertisement went on to say that he was the sole agent for Miller’s “The Best” Milwaukee Beer and wholesale agent for imported beers. The business incorporated in July, 1912. The incorporation notice appeared under the heading “New Queens Concern” in the July 30, 1912 edition of the Brooklyn Daily Eagle. The Henry C. Botjer Company of the Borough of Queens has been incorporated with the Secretary of State, to make and sell beverages, etc. with a capital of $10,000 and the following directors: Henry C. Botjer of Long Island City and James J. Sullivan and D. Walter Griffiths of New York City. Around the same time, the business moved to 404 – 406 Jackson Avenue in Long Island City, where it remained listed until 1918. During this period,the directory listings usually classified the business as wholesale beers. Second Avenue in Queens was later renamed 31st Street. The intersection of 31st Street and Broadway is now technically located in Astoria and situated under the elevated subway. The buildings on each corner are all old and could date back to the business. It’s not clear exactly where the Jackson Avenue address was located. The bottle I found is a machine made, 12 ounce, champagne style beer with a crown finish. It’s embossed “Henry C. Botjer Co. Long Island City” in small letters around the shoulder. 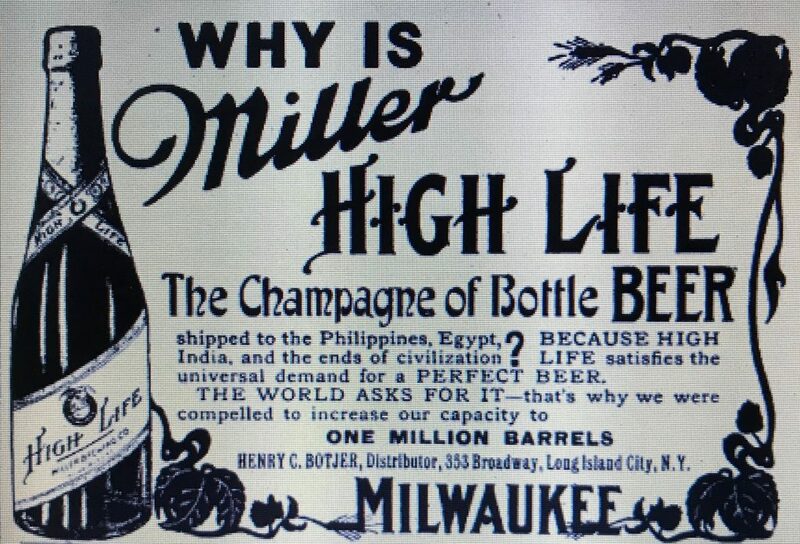 The bottle looks exactly like the one in the 1908 advertisement (without the label) and no doubt contained a “Miller High Life.” Machine made, it most likely dates to the later years of the business.